Although native to southern Illinois, the rounded chestnut oak thrives throughout growing zones 4 through 8. Other common names for the chestnut oak include basket oak and rock oak. This large tree will have a mature width of 60-70 feet and loves full to partial sun. It also prefers acidic, well-draining soil, though it is tolerant of alkaline and slightly moist soil conditions. 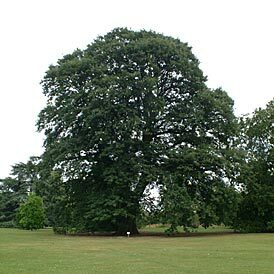 Chestnut Oak Trees is also resistant to periods of drought and wild trees often grow nicely in dry, poor soil. Although it’s slow to moderate growth, once mature, it makes a welcome addition as a shade tree and is suitable for sidewalks, yards, parks, or as a garden focal point. The V-shaped bark on the mature tree brings interest to gardens and sets it apart from other species. Related to the beech family, the deciduous tree’s fall foliage changes from red to orange to yellow before turning brown and shedding its leaves. Leaves are 4 to 6 inches long and serrated at its edges. This tree will also drop acorns ranging from 1 to 1 ½ inch long. Invited wildlife that growers can expect to see are cavity-nesting birds, various small mammals, and migrant birds. Chestnut Oak Trees provides ornamental beauty, shade, and animal habitat to even the poorest of soil conditions. Chestnut Oak Trees is a small short growing oak tree that grows naively from Canada to Florida on ridges and mountains. 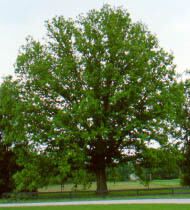 Chestnut Oak grows best in silt and clay soils. Chestnut Oak grows extremely slow and only rarely grows two feet in a single year. Chestnut Oak can adapt to many types of soils but prefers moist, well-drained soils and can often be found growing near large rocks and rocky zones. Chestnut Oak is an important food source for many types of animals as the acorns that fall provide a food source during the winter months.